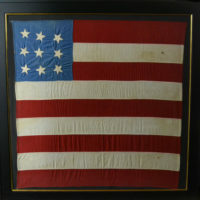 ANTIQUE 13 STAR FLAG. 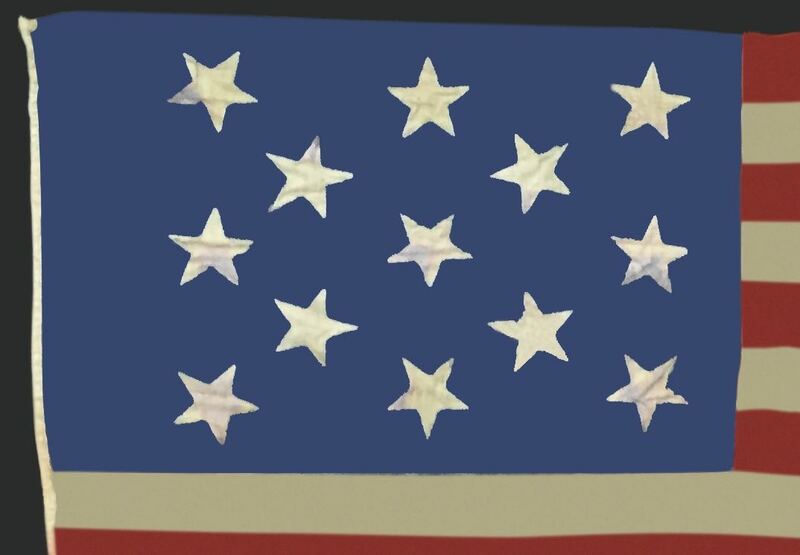 Rare 13 Star Flag with hand painted stars. 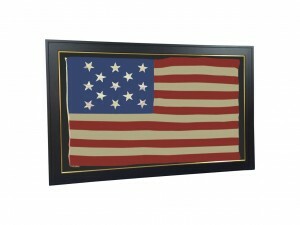 Some early pre 1800 era flags were painted and some military flags were hand painted flags during the Civil War. This is a very rare example and quite a find. Truly a beautiful flag, a real work of art! 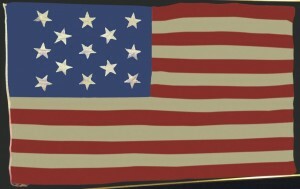 The 13 star flag is the most popular colonial flag. The flag became the official flag of the United States on June 14, 1777, which is now known as Flag Day. 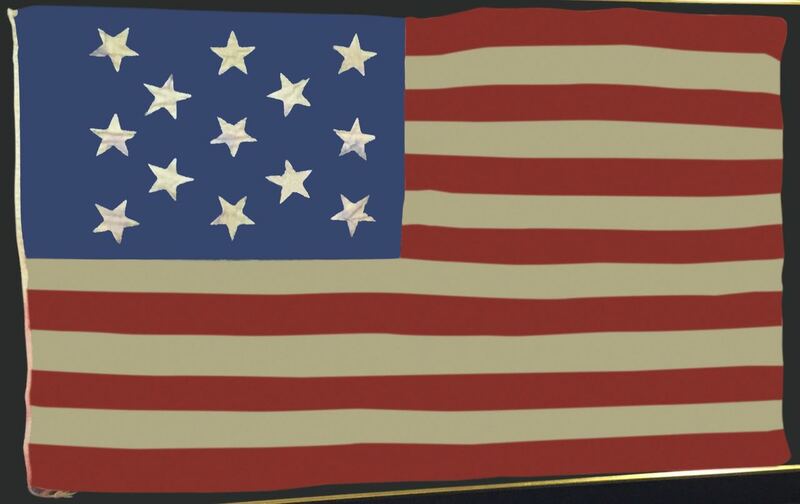 Once the independence was declared, the new United States desired to have its own flag. The Flag Resolution of 1777 on June 14th of that year was passed by congress. 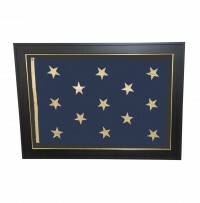 The 13 star flag has variations in design with The Hopkinson flag and Betsy Ross flag being two of the most well known of the variations. Though this flag appears to be the Hopkinson flag, closer examination of the stars let’s you know otherwise. 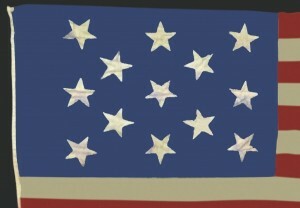 The Hopkinson flag differed in which the stars were 6 point as this flag has 5 point stars. This particular variation is known as the USS Ranger flag and is the first documented flag of the United States Navy.Other flags were flown by the Navy but this particular flag is the first to be documented for the U.S. Navy. The USS Ranger flag was first flown by Navy captain John Paul Jones on the USS Ranger on July 4, 1777. 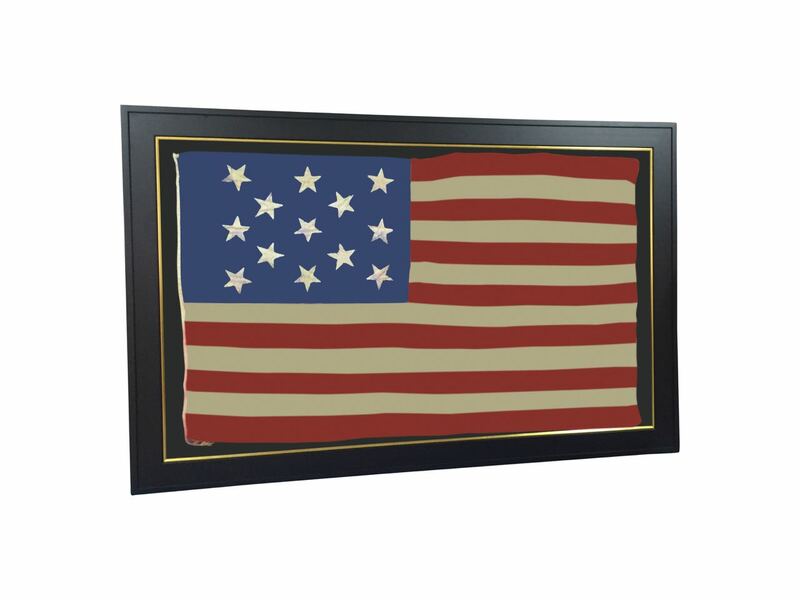 This flag comes with a Certificate of Authenticity, Museum framing with UV acrylic, and is white glove shipped.